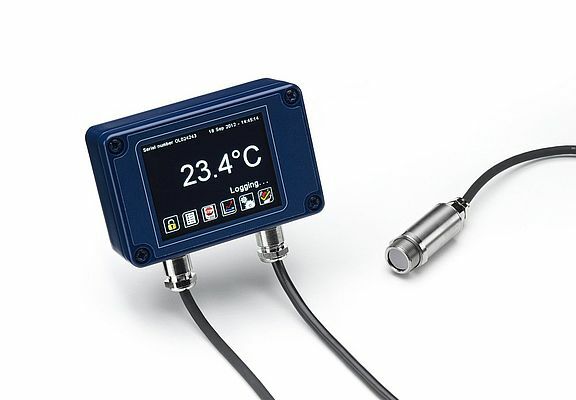 The new PyroMini infrared pyrometer from Calex Electronics has a miniature sensing head that measures 18 mm x 45 mm, making it fit for mounting in tight spaces. A high ambient version is capable of withstanding temperatures of up to 180°C without water or air-cooling. Manufactured from stainless steel 316 and sealed to IP65, the sensing head can be used for food and pharmaceutical applications among many others. A wide selection of optics allows the device to focus on small or large targets at short or long distances. The special low-noise interconnecting cable is resistant to interference from movement, making it possible to mount the sensing head on robot arms. It can be supplied in lengths from 1 m to 30 m.